Take the train to Amersfoort Central station. From the train station you can take bus line 1 and get off at the nearby bus stop at Nijverheidsweg-Noord. Alternatively, you can walk from Amersfoort Central train station: exit the station at the north side (Mondriaanplein) and turn right. After about 600 meters, follow the roundabout ‘counter clockwise’ to turn left. This road (de Nieuwe Poort) will lead to the Amsterdamseweg after about 200 meters. Just before the Shell gas station, turn right towards the Nijverheidsweg-Noord. After 600 meters you will find the Yellowstones office on your left. Take exit 12 – towards Bunschoten-Spakenburg and follow signs towards direction Amersfoort. After about 4 kilometres you will pass the river Eem. Go left at the traffic lights (Nijverheidsweg-Noord). After 900 meters you will find the Yellowstones office on your right. Take exit 5 – towards Maarn and follow the direction Soest over approximately 4.5 kilometres to the T-junction where Soest is indicated to the left and Amersfoort to the right. Turn right, follow the Amsterdamseweg for 1.5 kilometres and turn left at the traffic lights at the GAMMA store. 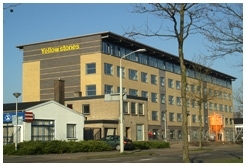 After 100 meters you will find the Yellowstones office on your left. Free parking is available both in front and rear of the Yellowstones office building.